It’s the summer of 1995. I moved to Jerusalem a few months ago, from the gritty Negev town where I had spent my first two years in Israel. I’m still walking around with a mindless grin on my face. What, real people can live here? Yes,it turns out that even on an Israeli librarian’s salary, it can be done. If, as an unmarried thirty-year-old, you’re willing to live with multiple flatmates and rickety furniture in the pre-gentrified Katamonimneighborhood – it can be done. 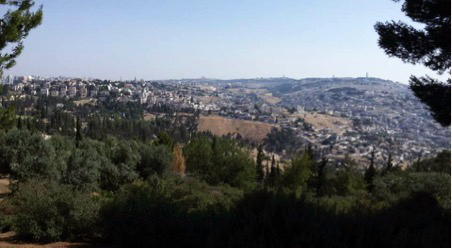 Reveling in my privilege, I decide one Shabbat afternoon to walk up to the Tayelet – a popular south Jerusalem promenade that overlooks the Old City. 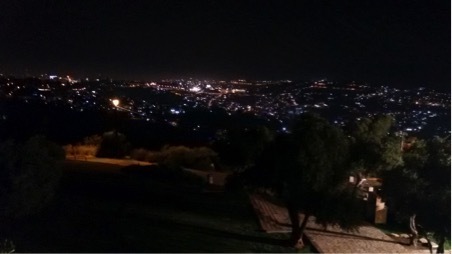 I will enjoy the Tayelet’sbreathtaking view– one of the perks of living in this expensive, difficult, but inspiring city. The Tayeletis plenty crowded on this lovely summer Shabbat. Lots of families picnicking. Clusters of religious singles singing zemirot together– Shabbat mealtime songs. The singles are pouring their hearts and souls into it, sending their solitary longings heavenward in chorus. A religious single myself, I could easily have been in one of those clusters, but for some reason decided to come to the Tayelettoday with only a book for companionship. Yet before I’ve made it very far along the Tayelet, I find I have another, uninvited, companion. A man is following me. Wherever I stop, he stops. Even when I sit down on the grass a short distance away from a picnicking family or a group of singles, he sits down next to me, telling me all the thing she’d like to do to me. I could approach one of the picnicking families or choral clusters for help. But while I’m frightened and disgusted, I also feel a kind of clinical curiosity. How long can a skuzzball harass a woman in a crowded public place before being scared off? At some point, I sit down on a bench. He sits down beside me. If his oratory was impressive before, it’s really something now that he’s in physical repose. He’s really pouring his heart and soul into it. As for me, I’m speechless. His eloquence goes on and on. I stare straight ahead of me, jaws working. A frisbee lands near my foot, is retrieved by a smiling teenager. A father grabs a straying toddler by the back strap of his overall. Pasta salads are passed around in Tupperware containers. Once he’s inside the men’s room, I hot-tail it out of there. They say you shouldn’t run on Shabbat, but this is pikuach nefesh– a matter of life and death that overrides regular Shabbat observances.I run all the way home, back to my walk-upon the very edge of the Katamonim, where there’s just enough funk to make my life interesting, but not too much. It amazes me that something like this could have occurred in broad daylight. What would happen to a woman who dared to walk the Tayeletat night? Oh, but she wouldn’t. It’s now spring,1998. I’m still single, still living with multiple flatmates in the same Katamonim walkup. Yet a lot has happened in the past few years. A prime minister has been assassinated. Buses have been bombed. There have been elections. On a personal level, I’ve “done” the bitza– the Jerusalem singles’swamp– and am about ready to leave. A brief but memorable engagement to a Russian musician down south has made me homesick for the Negev, and I’m thinking of moving back there– single or no. In the meantime, I have a second date with an American guy that a co-worker set me up with. There he is, one arm outstretched, hand on the doorframe, a pose that conveys restrained energy without detracting from an overall air of politeness. He’s wearing a plaid shirt looks like it made it not only across the ocean, but across several decades and fashion cycles. He escorts me to his car. I can probably count on one hand the number of times I’ve been inside a private vehicle in the nearly six years I’ve been in Israel. Used to lurching along the circuitous routes in which the local bus company specializes, I’m amazed at how quickly we reach the Tayelet. We chat and take in the view. I tell my date about the spitting incident, which cracks him up. Eventually, we fall into a comfortable silence. As I gaze at the stars, I’m reminded suddenly of my former flame, the Russian musician, who was into astrology. He’d found proof of our compatibility in our birthdates – well, so much for that. I’m also reminded of a silly employee-bonding event to which I and my co-workers had been dragged a few weeks earlier– breakfast at a hotel, followed by a lecture on astrology. I start telling my date about the lecture. He wordlessly communicates his opinion of astrology– an opinion I share– but listens attentively nonetheless. Among other things, the lecturer had offered an analysis of the Israeli political scene. Why hadn’t Peres worked out? Why did Bibi seem to manage against all odds? Apparently, it was all in the stars. Julie Rosenzweig is a Jerusalem-based translator, librarian, and mom. Her work has recently appeared in Literary Mama, Eunioa Review, the antiBODY poetry anthology, and the Times of Israel, among others.